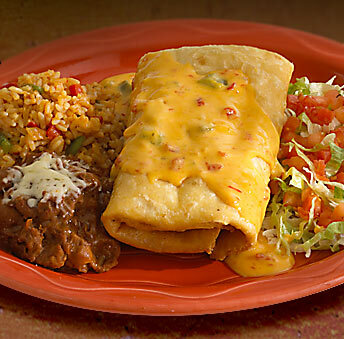 For Cinco de Mayo yesterday, in honor of Mexico’s freedom, I personally liberated a Chimichanga into my belly at lunchtime. It was actually a volunteer opportunity. A portion of my meal went to Meals on Wheels. Lots of restaurants or “beaneries” as my dad would call them donate a proceed of the day’s (or a few hours of the day) to organizations as fund raisers. It’s a pretty easy concept. The catch is getting people to go on that day, the groups hand out a flyer or coupon and it’s presented at the cash register. An organization can make several hundred dollars in just a few hours, sit and chat with people while they eat and make it a party all in one place. I was just going in to the local mexican restaurant to hoist that little chimichunga up on my shoulders in victory and have it do a pairs ice skating flip and twirl straight into a pile of guacamole and pico de gallo and right in to my mouth…I didn’t expect it to become a volunteer opportunity to fund raise for a non profit.